Mr. Busch is a partner at McGuireWoods LLP in Richmond. Mr. Busch’s practice focuses on complex litigation including toxic torts, environmental, and products liability litigation. He also has represented clients in the alcoholic beverage industry in regulatory, licensing, and franchise litigation matters for more than 35 years. 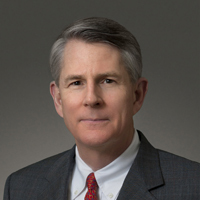 He recently completed his tenure as chair of the firm’s toxic tort and environmental litigation department, which followed his service as a member of the firm’s Executive Committee and Board of Partners. Mr. Busch was elected President of The Virginia Bar Association in 2010. He was elected a Fellow of the Virginia Law Foundation in 2012, and a Fellow of the American Bar Foundation in 2013. He serves on the faculty of the Virginia State Bar’s Harry L. Carrico Professionalism Course, and is a member of the Boyd-Graves Conference. Mr. Busch earned his juris doctor degree from the University of Richmond School of Law, and his bachelor’s degree from the University of Virginia.